Our next stop in the Etowah to Etowah in six hours trip was in the town of Tellico Plains, Tennessee. This online map shows the route we took for the loop. Our total drive time from Etowah took just over 20 minutes. The town also has shops but no nationally recognized brand names that I recognized. Visiting gives you the opportunity to try something new and support locally owned businesses. Tellico Plains has several restaurants to choose from. The Nut N Fancy Family restaurant is right on the skyway and Prospector's is on Mecca Pike. Shopping includes the Coker Creek Art Gallery, Tellico Art Center and others. We were ok on gas but be sure to check your tank before leaving. If you are driving the Cherohola Skyway the next gas station is beyond the state line in Robbinsville, NC. I tried to take photos of Tellico Plains but somehow overwrote the camera card. 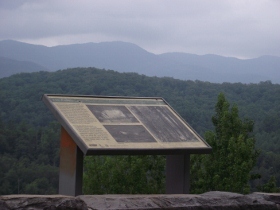 Instead, these photos from the Cherokee National Forest area near Tellico Plains. 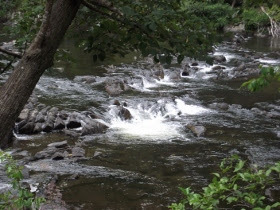 The stream you see runs toward Bald River Falls mentioned below. The shots give you a good idea of what the area is like. I'll have to go back to get photos of some attractions in the down. Tellico Plains is a small slice of Americana Pie that is filled with history, shopping experiences, nature and outdoor recreation activities. Other than a huge shopping mall and heavy traffic there isn't anything else it doesn't have.